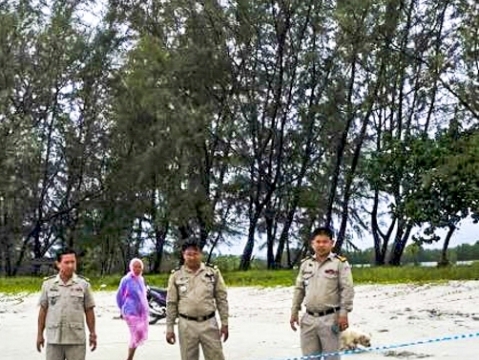 Home / beach / Dangerous Cambodia / News / otres beach / sihanoukville / Police in Sihanoukville investigate the death of a foreign national Tuesday. Police in Sihanoukville investigate the death of a foreign national Tuesday. SIHANOUKVILLE (Khmer Times) – An inquest in the United Kingdom to determine the cause of death of British tourist Peter Riley, following his mysterious death in Sihanoukville was adjourned this week to allow his body to be cremated in Jersey, England. Mr. Riley, 25, died in his room at the All Nations Guest House on Victory Hill on May 25. Ten days later, the body of another unidentified foreign national was discovered by police on a beach. He reportedly drowned. Mr. Riley and Mr. King’s deaths, along with several more, were caused by “heart attacks,” according to authorities. This frequent cause-of-death label raises concerns about police investigations, proper documentation of deaths of foreign nationals, and accurate determinations of the cause of death. While police forensics and investigation techniques are improving in Cambodia, routine toxicology reports and other examination methods generally have not, according to sources close to police. Critics say Cambodian police investigators often label the cause of death as “heart attack” when no other obvious explanation can be found. Cambodian authorities lack accurate and up-to-date data on the number of foreign national dying in the country. Major General Uk Heisla, Chief Investigator at the Ministry of Interior’s Immigration Department, said he did not know how many foreigners died in Cambodia last year. Officials from the General Commissariat of National Police also lacked an exact figure on the number of foreign nationals who died in the Kingdom last year. But, a report published by the Ministry of Interior last year said the number of foreign nationals who died in the Kingdom rose by 50 per cent in 2013 over 2012. However, it recorded only 14 such deaths in 2012 and 21 in 2013. The number of foreign nationals who die here is not considered high, considering the number who visit – about 4.5 million last year. But it is widely believed that the number of foreigners who die here is higher than government figures suggest. Last year, the deaths of 82 foreign nationals were reported in local media. Nearly half of these, 36, occurred in Preah Sihanouk province, compared with 34 in Phnom Penh and eight in Siem Reap, according to a tally reported online at Khmer440.com and verified by Khmer Times. Consular officials for Western embassies have told Khmer Times reporters that foreigner deaths in Phnom Penh and Preah Sihanouk province seem to be disproportionately alcohol and drug-related. In contrast, Siem Reap, which in general gets more elderly and affluent foreign tourists, sees more tourists dying due to heat and the exertions of exploring Angkor Wat. The Khmer440.com tally for 2014 is about four times higher than the figure reported by the Interior Ministry for 2013. The most common cause of death for foreign visitors to Cambodia last year was “heart attack,” followed by “unknown” and “suicide,” according to the compilation from reports in local media. According to these reports, 49 foreigners have died so far this year. Poor record keeping at the national level could be to blame for the lack of accurate official data. Other reasons include the fact that death certificates are not always issued for foreigners in Cambodia. Often they are only issued if requested and paid for by an insurance company for example. Violent crime against foreigners in Cambodia is considered rare. Only four foreigners were murdered here last year, according to news reports. Despite concern about unreliable official data and of investigations to determine cause of death, reports of foreign fatalities in the Kingdom are low considering the high volumes of visitors. “We advise all visitors, however, to have adequate insurance and be covered for existing health conditions and your planned activities as healthcare and other services here aren’t always the best,” the official said.